Deonte Carraway faces 270 counts for sexually abusing children in Prince George's County. He's written a letter asking a judge to drop the charges against him arguing that his constitutional rights have been violated. UPPER MARLBORO, Md. — A man facing 270 counts for sexually abusing children in an elementary school and recreation center in Prince George’s County has asked a judge to drop the charges against him and said that he has not received adequate legal representation. “My rights have been violated,” he writes in the letter dated June 12. His public defenders declined to comment on the letter. Green wrote Carraway back, telling him he was forwarding the letter on to Judge Beverley Woodard, who is presiding over his trial. Woodard wrote Carraway on court letterhead dated June 21 that the parties could discuss the matter at his next hearing, which is set for July 13. 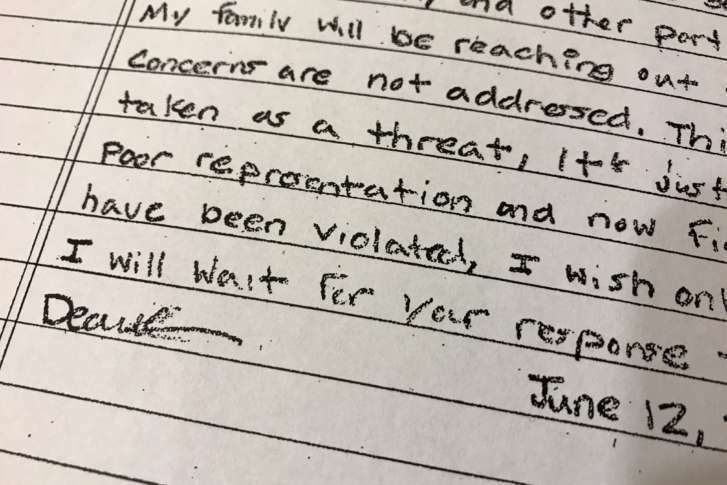 In the letter, Carraway writes that his main grievance was that he had not signed “any sort of paper waiving my Hicks date,” a reference to the state law requiring trial proceedings to begin within 180 days of when the charges are filed. However, Carraway’s signature is on a Hicks waiver filed with the Prince George’s County Circuit Court last November. The waiver reads “I expressly consent to a trial date beyond the 180-day period required by this rule.” The signature on the waiver matches his signature on the letter to Green. Woodard said she would send Carraway the Hicks documents associated with his case. Between August 2015 and February 2016, the former teacher’s aid at Judge Sylvania Woods Elementary School in Glen Arden, Maryland, volunteered at the school, where he also took cellphone videos of students ranging in age from 9 to 11 and shared them on a messaging app, court documents said. Some of the videos were taken off school property including in the homes of three of Carraway’s victims, according to the documents. Earlier this year, Carraway pleaded guilty to related federal charges.